Images of summer continue. Until I lived in London I associated gulls with the beach. Now I include the river Thames. They seem to know exactly which tourists will have some lunch to share. Don't forget to visit other skywatchers around the world. And sharing is sometimes not an option! Wonderful shot. the background looks so perfect, its looks photoshopped. Nice shot. What an absolutely amazing shot! One of the best photos I have ever seen. Perfectly captured! He looks like he's jumping up and down on a trampoline! The sky is beautiful. The bird looks like he is posing for you. There are seagulls in Utah too. Not even close to the ocean. But I'd never get such a great shot. At the correct moment ! Great shot ! ! ! This is such a fun and wonderful photo. I've always liked the seagulls until last May one of them attempted to attack me to try to get some food I was eating. Vicious thing! All the best. Ciao. A. Beautiful pic. I like the sky background very much. And I thought the bird looked at me and greeted me when I look at it lol. I like gulls. I think they are fascinating - and scary at the same time. Because of their size. No not photoshopped. It is a a very wide F stop that makes the background go out of focus. I have made a slight adjustment to the brightness that's all. Wonderful! The clouds in the background were perfectly out of focus:-) Nice shot! Timing is everything - yours was right on , Mo! 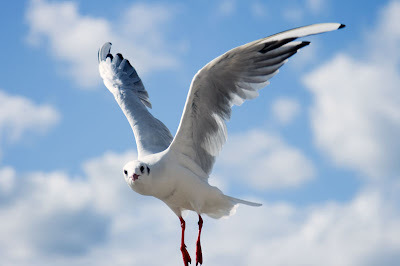 There is something I really hate about seagulls, they must be the ugliest bird out there.